Why get married at Colshaw Hall? Colshaw Hall is a luxurious and exclusive wedding venue in Cheshire. This Grade II listed hall is situated on a private country estate and has been lovingly restored by the Irlam family. This stunning venue offers you many options to create your perfect wedding day or celebration. 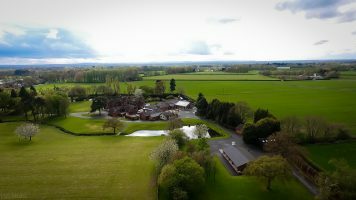 Colshaw Hall is located in a convenient position, just outside Knutsford and within easy reach of Chester, Manchester and Macclesfield. Colshaw Hall is the perfect choice for a sumptuous wedding venue or prestigious event in Cheshire. What’s more, the estate is always exclusive to you throughout your event, so it offers complete peace and privacy. From the moment you enter the gates and drive along the elegant driveway, you and your guests will know that this will be a day to remember. Before you reach the hall itself, you will pass the gorgeous Japanese style garden and miniature lake, which adds to the splendour of this luxury wedding venue. Also located in the grounds, the light and spacious Stables is a dedicated ceremony room, complete with oak beams and marble flooring. For parties and wedding receptions, the magnificent Peel Suite is a banqueting hall, complete with a stylish bar overlooking beautiful walled gardens. The suite offers contemporary comfort and state-of-the-art facilities in a classic countryside setting, making Colshaw Hall one of the most luxurious and exclusive wedding venues in Cheshire. Colshaw Hall also offers the ultimate in convenience for your wedding day, with bedrooms available for you and your wedding party and a breakfast provided the following morning in the light and airy Orangery. There is also further guest accommodation located in the grounds. Your guests can stay in the contemporary and cosy Courtyard Cottages and the spacious Irlam Lodge. The Hall is set in beautiful gardens, including the stunning Magnolia Garden and exquisite Walled Garden. These provide the perfect backdrop for your wedding videography and provide abundant room for all of your guests. Colshaw Hall has hosted many Cheshire weddings throughout our history and we aim to make each one as special and memorable as the last. No luxury wedding venue in Cheshire would be complete without the most sumptuous and elegant food. Their caterers will provide you with a wedding breakfast, perfectly fitting for the beautiful and stylish setting. If you are looking for a wedding videographer at Colshaw Hall, or any other wedding venue, then please get in touch to see if we are available on your date.